Recently I read about someone who thought wrapping was a complete waste. I disagree. A beautifully wrapped present stirs up more excitement and anticipation than a shopping bag ever could. It can show originality, personality and thought... when you think about it. Yes, wrapping paper gets ripped off in 5 seconds and then sits in a landfill for 50 years. But, if you put your thinking cap on, there are many ways you can reuse items from around the house to dress up your gifts and in some cases give the recipient a little extra to take home. Here are some nifty ideas I've picked up from around the web. 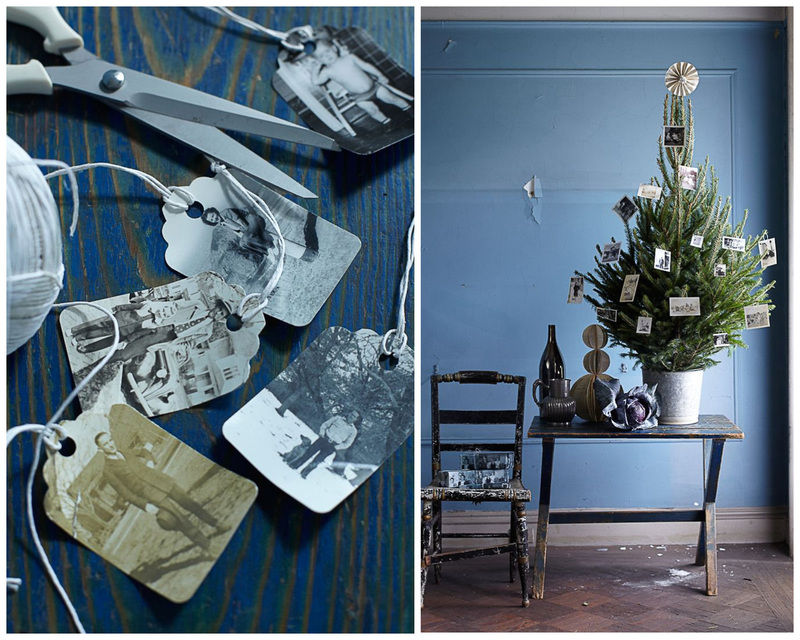 Another great use for old Christmas cards and so easy! Cut them into rectangles, punch a couple holes and string some spare yarn or ribbon through. Done. 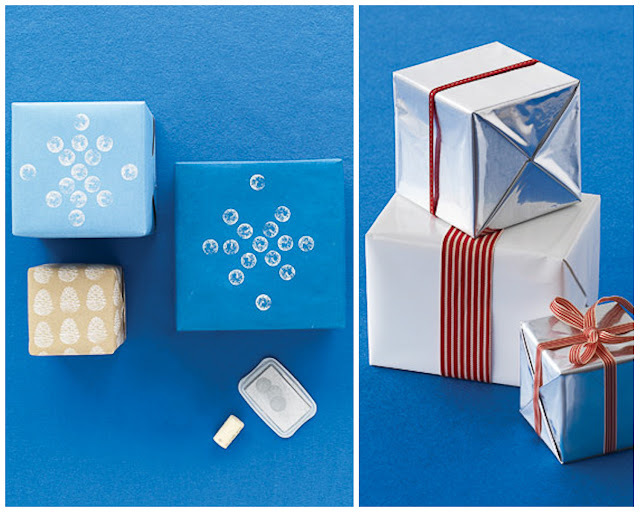 Don't throw away that extra couple inches of wrapping paper either - punch out some circles, string through some more yard and you have really cute garland-style gift toppers. The vintage brooches are my favourite though. An elegant gift fit for a lady! There are 3 more amazing ideas where I found this one using greenery, buttons, and ornaments. Just like my old Christmas cards, I knew there was a reason I was holding on to piles of extra fabric bits and pieces! They can be easily and quickly sewn into reusable gift bags and ribbon! 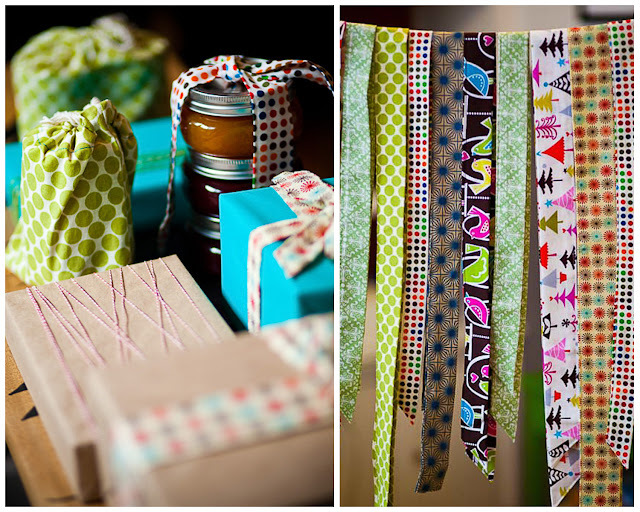 Fabric bags are great for hard-to-wrap items or add a personal touch to a simple bottle of wine. And the ribbon is adorable! I can't wait to try it! Thank you Jenny and Design Sponge. I love, love, love these tags! Sweet Paul suggests photocopying old photographs of the people you're actually giving the gift to. While this is super sweet and personal, photocopying is not so eco-friendly. I suggest going to an antique shop and buying up a bunch of old photographs - every store seems to have a box of them - and make the tags out of them. They look really cool hanging on the tree as well! I don't know about you, but I always feel guilty throwing out those crisp paper bags you get from retail stores. I end up stashing them under my sink until I can't close the cupboard door anymore! Why not cut them open and use them as gift wrap? Extra points for stamping. Any idea how Martha got the pine cone look shown on the little brown and white one? 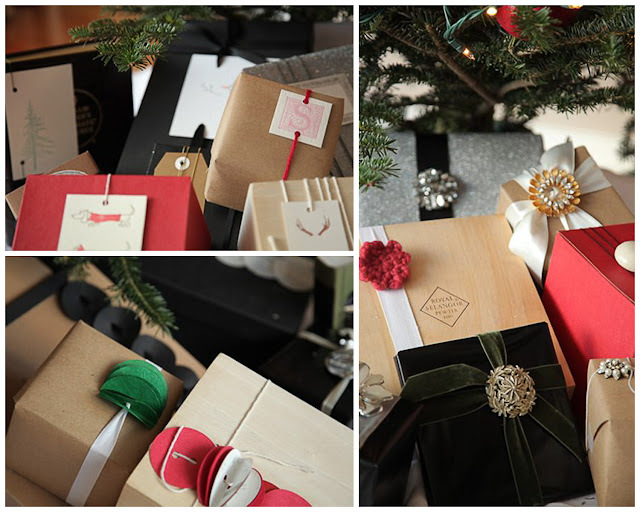 Now, can you guess what the gifts on the right are wrapped with? Potato-chip bags! Who knew chip bags could look so beautiful! Caution: this does not give you permission to eat all the chips in your house in order to get to the bag. Haha! I also like to spend a lot of time on wrapping and making gifts look pretty, so I love the Christmas card idea! My other favourite is the old pictures used as tags. Don't you find only certain people appreciate this kind of thoughtful wrapping, though? Yes, but it's worth it for the few times that you hand someone their gift and they look back at you with a big smile on their face and say "Wow, such pretty wrapping!" Usually a woman. Usually my mom. Haha!